Contents: Doctor Strange #169 (June 1968) to #178 (March 1969) and #180 (May 1969) to #183 (November 1969), Avengers #61 (February 1969), Sub-Mariner #22 (February 1970), Incredible Hulk #126 (April 1970), Marvel Feature #1 (December 1971), and Marvel Premiere #3 (July 1972) to #14 (March 1974). * Part 1 covers Doctor Strange #169-182 and Avengers #61, with the start of new writer Roy Thomas joined quickly by Gene Colan to tell some breath-taking stories of the Sorcerer Supreme. Colan’s art is incredible in this edition and jumps off the page with pure energy. * Part 2 covers Doctor Strange #183, Sub-Mariner #22, Incredible Hulk #126, and Marvel Feature #1, which gives us the origin story of the non-group of heroes known as the Defenders (Doctor Strange, Namor the Sub-Mariner, the Hulk, and the Silver Surfer). To get the full story arc for this, I suggest reading Essential Defenders Vol. 1, as not all parts of the complete origin are contained in this volume. 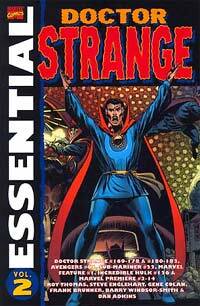 * Part 3 covers Marvel Premiere #3-14, where once again Doctor Strange is given the chance to be the lead in the book. His run would end in this title with issue #14 but picks up the next month with a new Doctor Strange #1, which can be found in Essential Doctor Strange Vol. 3. The highlight of this run is the start of Steve Englehart’s association with Doctor Strange, which would continue on for many years. What makes this Essential? : For me, the highlight of this book is the Gene Colan art in the first part of the book. I have never been a big fan of the character of Doctor Strange, but I found myself pulled into these stories by the artwork. I don’t know if this volume is truly essential, even if you are a fan of Doctor Strange. Footnotes: Doctor Strange #169 was the “first” issue of the character’s own title. Prior to this issue, Doctor Strange shared the Strange Tales comic with Nick Fury, Agent of S.H.I.E.L.D. Strange Tales came to an end with issues #168. The title was renamed Doctor Strange for #169, keeping the previous numbering, which was the norm for this time. Avengers #61 was also reprinted in Essential Avengers Vol. 3. Doctor Strange #179 was not collected in this volume. The issue reprinted Amazing Spider-Man Annual #2, which has been included in Essential Spider-Man Vol. 2. For Marvel Premiere #11, the cover and the framing sequences are included in this volume. The issue contains reprinted stories from Strange Tales #115 and #117, which were included in Essential Doctor Strange Vol. 1. If you like this volume, try: Superman: The Phantom Zone TPB, which was recently re-released by DC Comics. The main story is written by Steve Gerber with art by Gene Colan (hence the recommendation). This was originally a mini-series from 1982. The paperback is printed on a bright white glossy paper, which accentuates Colan’s art beautifully. The story features the Phantom Zone villains (more famously featured in the Superman motion pictures) escaping to Earth and imprisoning Superman in the zone. He must travel through the different worlds of the Phantom Zone before he is able to escape and return the Kryptonian criminals to their rightful place. This entry was posted in Doctor Strange, Marvel Essentials and tagged Barry Windsor-Smith, Doctor Strange, Frank Brunner, Gardner Fox, Gene Colon, Roy Thomas, Steve Englehart. Bookmark the permalink.